reSAWN TIMBER co., Author at reSAWN TIMBER co.
reSAWN has created this architecture & design tour of shou sugi ban throughout New York City including Manhattan and Brooklyn. The tour includes many restaurants, private homes, and businesses. Use this link: NYC tour of shou sugi ban to view the tour including addresses and instructions for getting to each location. reSAWN’s award-winning CHARRED collection pays homage to the traditional Japanese technique of “shou-sugi-ban” aka “yakisugi” without being literal. reSAWN uses domestic wood species whenever possible, including Cypress from the Southern US and domestic White Oak, Black Walnut, Red Oak & Ash as well as reclaimed woods from the US. The designs in the CHARRED collection have been carefully developed using modern finishes and incorporating reSAWN’s many years of experience in the architectural & design specification market. reSAWN manufacturers charred wood products for a range of applications including exterior siding, interior wall cladding & flooring, and custom furniture. The tour includes 8 stops beginning on the Upper East Side of Manhattan and concluding in Park Slope Brooklyn. Begin your tour where reSAWN worked with Cherico King Architect to specify KUJAKU shou sugi ban charred cypress in select grade at this modern take-away joint delivering creative sushi and salads through online & iPad orders located in New York City. The second stop is at Citizen Watch Company’s global flagship store in Times Square. With over 1,300 square feet, the new store gives Citizen the opportunity to feature a full range of their offering and to enhance consumer appreciation for the brand on a grand scale. New York based architectural firm Mapos select reSAWN’s NETSU shou sugi ban red oak wall cladding for the interior of the store. East Bay Floor Covering Inc.
Redwood City’s 1300 Island Dr is a fabulous office space with 48,384 square feet and great amenities in the heart of Redwood Shores. Close by restaurants, shopping, scenic parks and easy parking & transportation. Gensler selected reSAWN’s AMITY wide plank euro oak flooring for the lobby renovation at this amenity-filled tech park in Redwood City. This private residence is located in Longport, New Jersey. The beautifully renovated beach home features reSAWN’s HOWAITO and SURETO shou sugi ban exterior siding, along with North American White Oak flooring. This material was specified by Philadelphia Design Co., known for high-end residential design. Materials were specified with a 5″ wide face and shiplap milling with a 1/8″ reveal. Installation is being done by Seashore Exteriors, a 4th generation company specializing in residential and commercial exteriors in the south NJ area. reSAWN’s award-winning CHARRED collection pays homage to the traditional Japanese technique of “shou-sugi-ban” aka “yakisugi” without being literal. Historically very specific in their definition, “shou-sugi-ban” and “yakisugi” have become common nomenclature for modern charred wood designs in general. 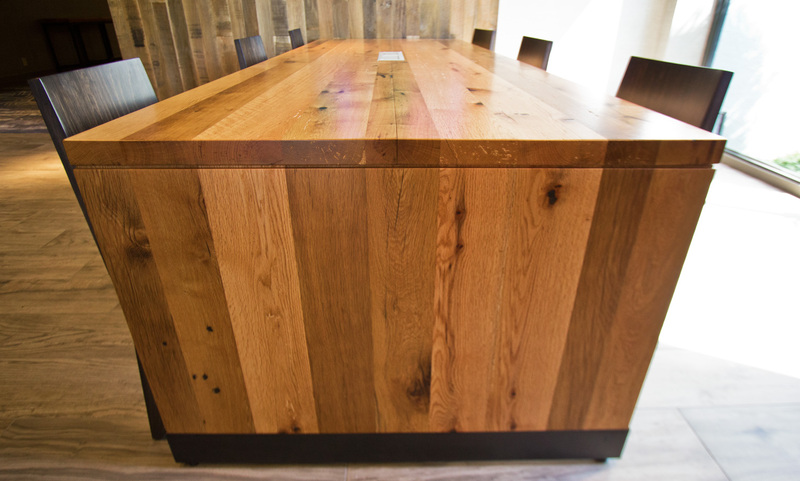 All of reSAWN’s CHARRED products are made in the USA, in their facility in Telford, PA. reSAWN uses domestic wood species whenever possible, including Cypress from the Southern US and domestic White Oak, Black Walnut, Red Oak & Ash as well as reclaimed woods from the US. The designs in the CHARRED collection have been carefully developed using modern finishes and incorporating reSAWN’s many years of experience in the architectural & design specification market. reSAWN manufacturers charred wood products for a range of applications including exterior siding, interior wall cladding & flooring, and custom furniture. This private residence is located in the Queen Anne Hill neighborhood of Seattle, Washington. The beautifully renovated fire station features reSAWN’s SORA shou sugi ban interior wall cladding and MOYASU shou sugi ban exterior siding. Queen Anne Hill is a neighborhood and geographic feature in Seattle, Washington, northwest of downtown. The neighborhood sits on the highest named hill in the city, with a maximum elevation of 456 feet. It covers an area of 2.8 sq mi, and has a population of about 28,000. Queen Anne is bordered by Belltown to the south, Lake Union to the east, the Lake Washington Ship Canal to the north and Interbay to the west. The hill became a popular spot for the city’s early economic and cultural elite to build their mansions, and the name derives from the architectural style typical of many of the early homes. The wood is carefully charred, misted with water, cooled, brushed to remove dust and loose debris, and then stained/sealed to create the unique designs you will find in the CHARRED collection. The top coat sealer is applied prior to shipping (for exterior applications, we recommend sealing the face & back). Terrapin Row is a transformative student housing complex located on the University of Maryland’s historic South Campus. The mixed-use community will feature 1,493 beds across 418 apartments, as well as a 489-space parking garage. Terrapin Row will boast ample amenities centered around a college lifestyle, including a swimming pool, volleyball court, outdoor kitchens and fire pits, exterior TVs, a fitness center, bike storage, a cyber café and game room, and numerous live-learn spaces. The multi-phase project will consist of seven buildings, and will encompass a pedestrian and bike-friendly Village Green surrounded by over 11,856 square feet of retail space. The Village Green will flow into a grand stairway and amphitheater that opens to a pedestrian plaza named “the Muse,” which will usher pedestrians towards the main academic centers of campus. Several building including the fitness center and game room feature reSAWN TIMBER co.’s KUJAKU shou sugi ban CHARRED wood as specified by WDG Architecture. WDG provides architecture, master planning and interior design from our offices in Washington, DC and Dallas, TX. Their award-winning work can be found in major metropolitan areas around the United States as well as overseas. They have a staff of more than 120 and have produced more than 500 major buildings, including commercial office, multifamily residential, higher education, institutional, hospitality, and mixed-use projects since their inception in 1938. During these seven decades, great commercial architecture has been the hallmark of WDG’s portfolio. WDG’s mission is to create buildings that reflect each client’s unique identity and aspirations. By balancing the art and science of architecture, challenges like market economics and zoning limitations become a chance to pioneer design solutions that can create truly inspiring spaces. Their firm-wide culture fosters and demands both aesthetic excellence, as well as new standards in technical innovation and building efficiency including the application of advanced materials, high-performance systems and sustainable design. WDG has emerged as a leader in sustainability and green building practices. LEED accredited professionals are found at all levels within our firm—in design leadership, project management and professional personnel.